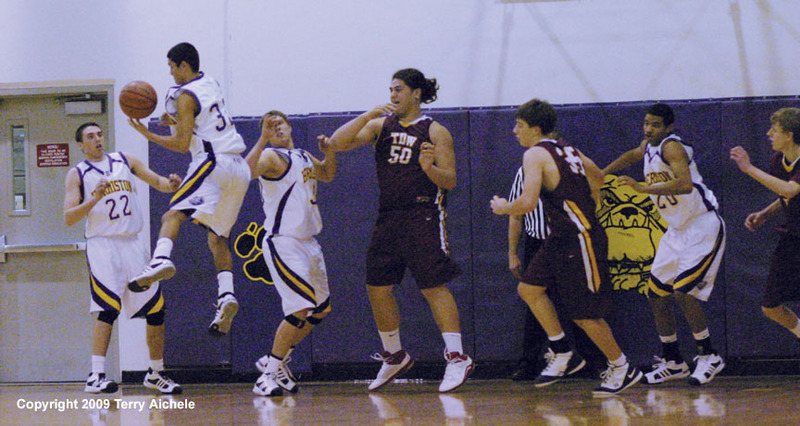 Hermiston's Luis Ortiz beats teammates and TDW big man James Atoe to grab a rebound during the game on Saturday night. 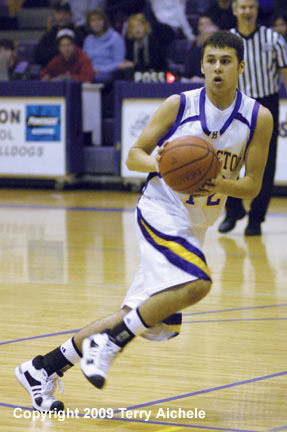 HERMISTON - The Hermsiton Bulldogs hosted The Dalles/Wahtonka Eagle Indians Saturday night January 17, 2009. 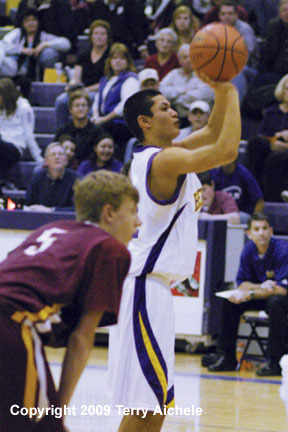 It was a physical game with Hermiston's big men going up against 6'6" James Atoe of TDW. Hermiston led at every break and frustrated the Eagle Indians by breaking up their plays. 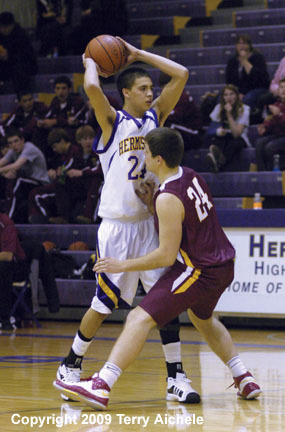 Hermiston won 74 to 62. The first quarter had the teams exchange the lead but Hermiston showed it's defensive ability with pressing the Eagle Indians and a steal here and there. 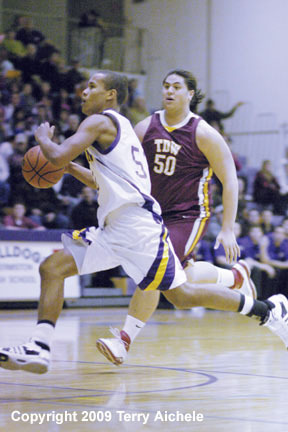 Top scorers in the first quarter for the Dawgs included Ricardo Rodriguez, Luis Ortiz, Jonathan Kayembe, and Bradley Irwin. The first ended with Hermiston leading 19-16. Hermiston solidified their lead in the second period outscoring TDW 15 to 13 and stretching their lead to five points. Dawgs scoring included Dorian Williams, Ortiz, and Kayembe. Hermsiton went into halftime leading 34-29. The Dawgs continued to control the ball and push the lead out to nine points in the third period. Cody Meeks had a good period hitting back to back threes late in the period then capping off the period with a trey. Hermiston led 50-41 at the end of the third. Hermiston scored 24 points in the fourth period. TDW scored 21 but they ended 12 points short at the end of the game. Luis Ortiz had a hot period hitting a trey, hitting four foul shots, and several shots from the field. Jonathan Kayembe also had a good period. Dorian Williams, Bradley Irwin, Mike Royer and Mitch Thompson hit shots for the Dawgs. The Dawgs won convincingly 74 to 62. 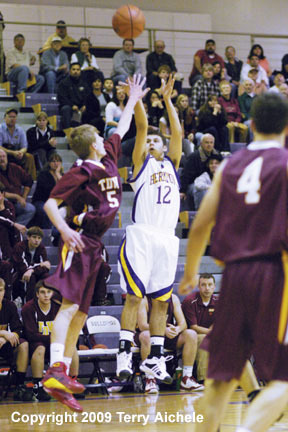 LEFT - Bradley Irwin of Hermiston shots a jumper during the game Saturday night. RIGHT - Jonathan Kayembe of Hermiston sprints past TDW center James Atoe. 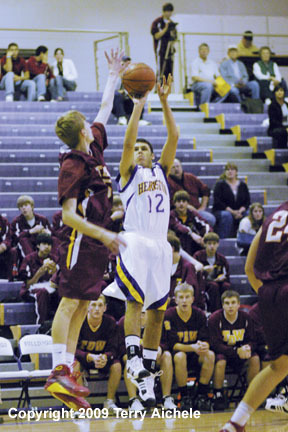 LEFT - Bradley Irwin of Hermiston lets fly with a shot. 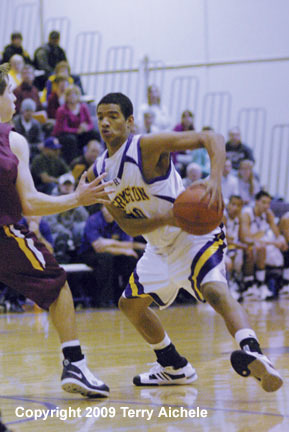 RIGHT - Jonathan Kayembe of Hermiston reacts to a TDW defender. LEFT - Cody Meeks of the Dawgs looks for a teammate to pass to. RIGHT - A Hermiston cheerleader gets the crowd fired up in the second half of the game on Saturday night. LEFT - Bradley Irwin of Hermiston makes a cut while looking back at a teammate. RIGHT - Luis Ortiz of the Dawgs shooting a foul shot.